The State Department of Transportation recently proposed a vehicle miles traveled or VMT initiative in which drivers would be charged on how much they drive rather than the current fuel tax of 16 cents/ galloon. West Maui Representative, Angus McKelvey spoke out against this proposal stating that it is unfair to West Maui residents who are already at a hardship of driving long distances to access essential services in Central Maui. Representative McKelvey says he does recognize the need for funding for critical road projects and would like to look at other revenue generators such as rental cars. P.S. - Today is Price Kuhio Day, a public Holiday in Hawaii. Schools, government offices and some businesses are closed. The State Holiday celebrates and remembers Prince Jonah Kuhio Kalanianaole's life and efforts to improve the lives of the people of Hawaii. 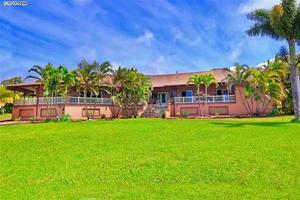 Ocean views and Maui breezes are captured in this 2 story 5 bed, 3.5 bath residence. Direct views of Molokini and the West Maui Mountains. Conveniently located in a quiet neighborhood, yet minutes to world-class beaches and the Wailea Resort. The open concept design living, dining and kitchen area opens to a spacious lanai with 2 sliding doors. Live in Kaanapali Hillside comfort, located just 1 mile from World famous Kaanapali Beach. This home's design provides ocean, island and mountain views with lanais off of every room, while maximizing privacy. Its master suite with an office and a den allow for maximum flexibility. $1.65M (FS) Drive through the paved, private gated entry to Aloalii subdivision, turn onto the long palm-lined drive to this well-built 4 bed, 4.5 bath home. The raised post and pier architecture and high vaulted beamed ceilings help create panoramic views using the large sliding glass doors. $6.3M (FS) Over 3/4 of an acre with this prestigious one of a kind 8,178 sq ft home with 8 beds, 8.5 baths, designed by Master Architect Rick Ryniak and built by Gary Dixon Construction, one of Maui's finest custom home builders. Located on the Kapalua Bay Course with magnificent ocean, Lanai, Molokai, and sunset views all year round. $6.795M (FS) The spirit of adventure brought you here, now a place of extraordinary serenity awaits in Makena. This secluded setting encompasses over two and a third acres of pristine, parklike beauty. Passing through the private, gated entry, you are transported to a 4 bed, 4.5 bath estate where dreams are made. $12.75M (FS) Black Sand at Makena consists of a 7 lot oceanfront compound with gated entry. This home affords one of the premium view locations in all of Makena. This 5 bed, 5 bath home, originally purchased in 2008, has had extensive upgrades and has been beautifully maintained in a pristine condition. Bank Owned - Unique opportunity for a 3 bed home in Kihei with a detached 2 bed Ohana one block from the Beach. If you are looking for a home to live in and provide you with assistance in additional rental income, look no further. Great potential in this 3 bedroom home and 2 bedroom ohana cottage located in North Kihei. Short Sale - Great opportunity to own in a quiet neighborhood in Pukalani. This 3 bed, 1 bath house offers many options and has great potential. 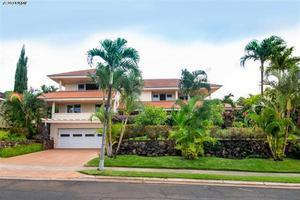 Welcome home to this very stylish and upgraded 4 bed, 3 bath two level home with fenced in yard which is located just inside the entrance of the desirable Maui Lani Traditions. This home was the original property of the Traditions and the Owners have taken meticulous care of both the spacious feeling interior and the exterior landscaping and grounds. This spacious 4 bed, 2.5 bath home has the added bonus of having the master bedroom downstairs if one desires single level living with the convenience of having three more bedrooms and an office nook upstairs. $749K (FS) Experience the joy of having space. Enjoy the comfort of a split level home with 4 beds, 3 baths and 2 family rooms for maximizing your family entertainment. Extend your dining and living experience out to the large lanai and enjoy Maui sunsets and ocean and mountain views. $839K (FS) Located in the highly desired Waiolani Mauka subdivision, such a country feel yet minutes from town. This executive 3 bed, 2.5 bath home features the great room, kitchen, master bedroom and one of two large Lanais on the second floor for your best views. Ideal for taking advantage of the views of Kahului harbor and beyond, Haleakala and the West Maui Mountains. There is a 1 bed, 1 bath ohana. $1.295M (FS) Enjoy spectacular ofrom the living area, the lanai, and the master bedroom of this recently and completely renovated, 2 bed, 2 bath, Royal Mauian unit. The renovations include a brand new kitchen, new bathrooms, new flooring, and much more. 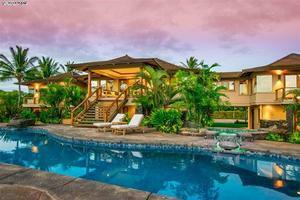 Hokulani 1034 is an exceptional home on the top floor of Honua Kai Resort. This penthouse suite's intimate airy ambiance is second to none. Privately located on the cool Northeastern corner, this 2 bed 2 bath suite offers a luxurious setting with a unique floor plan. Enjoy spacious rooms, ocean and mountain views by day and stargazing by nights. Montage Residences Kapalua Bay, A truly one-of-a-kind opportunity to own a 3 bed, 3.5 bath home along the West Maui shoreline, overlooking the white sandy crescent of Kapalua Bay, with panoramic ocean views framed by the neighboring islands of Molokai and Lanai. Located within the renowned Kapalua Resort, home to two championship golf courses, miles of hiking trails and an array of ocean activities. $2.998M (FS) Wailea Point is prominently positioned upon the 28 ‘Premier Oceanfront' acres in world class Wailea resort, next door to The Four Seasons. It offers guard gated and 24 hour roving security. Wailea Point #2302 is a 3 bed, 2 bath superb view oriented residence within this low density, revered, lush tropical paradise. $13.25M (FS) Wailea's finest ocean front villa. This rare direct ocean front fully furnished 3 bed, 3.5 bath villa has dramatic unobstructed ocean views and is positioned directly on world famous Wailea Beach. The elegant and spacious combined int/ext 3,535 sq ft single level floor plan offers idyllic indoor/outdoor Hawaiian style living complete with 3 bed, 3.5 bath, large lanai, extensive lawn area and private plunge pool with outdoor shower. A direct oceanfront 1 bed, 1 bath condo in historic Lahaina. Unit upgraded in 2018. Enjoy the swimming pool and BBQ areas or relax on your lanai while watching whales play in your backyard during whale-season. When they are not there, there's the all-year sunset and island views of Lana'i and Moloka'i. Take this opportunity to own this beautiful 2 bed, 2 bath condo at oceanfront Kahana Sunset. If you are looking for white sand beach, sunset views and a quiet getaway this is the location for you. This 2 bed, 2 bath is located on the quiet, scenic side of the Grand Champions complex. This recently remodeled unit features the peace and serenity of Haleakala and golf course views from the living room and master bedroom. Conveniently located within walking distance of the famed Wailea Tennis Club, Wailea Blue Course and some of the world's best beaches. Wailea's newest luxury resort project, Keala O Wailea is perfectly situated to capture views from Molokini to the West Maui Mountains with much privacy. This 2 bed, 2 bath unit features over 1,200 sq ft on the ground floor in the 2 building. This beautifully upgraded unit is priced to sell, with intelligent features such as canned lighting throughout. This 2 bed, 2 bath Keala o Wailea unit has an amazing view with a large floor plan overlooking the stunning tropical pool and the Wailea Blue Golf course. Walk to 6 Restaurants in less than 5 minutes and just 1 year old with all the amenities. 2 parking spaces. Including carport with extra storage, large lanai with propane plumbed in for your private outdoor kitchen. $1.65M (FS) Beautifully situated on over 6 acres of ocean view property, this Na Hale O Makena 3 bed, 2.5 bath condo is on the ground floor, making it easily accessible from the beach across the street, as well as nearby resort shopping, golf courses and top rated restaurants. With gated entrances, covered carports and a large private access foyer, this home is an exclusive and tranquil retreat. Clean, well maintained 2 bed, 2 bath unit located in popular Kahului Ikena. Great convenient location near schools, medical facilities, parks, Maui Arts & Cultural Center and other conveniences of central Maui. Dishwasher, microwave, full-size washer & dryer, split system air conditioning in living room and ceiling fans with lights in living room and bedrooms. $324.9K (FS) Iao Parkside is known for its perfect location in Wailuku where it is an easy access to all parts of the island and pet friendly. Beautiful West Maui Mountains are viewed from this second floor, 2 bed, 2 bath unit where you get great cross ventilation. Located on the right side of the first building on the left when you drive into Waiaka Lane. This brand new 2 bed, 2 bath condo has upgraded stainless steal appliances and upgraded shutters throughout. Huge mountain views from this turn key top floor unit. Fully-equipped, with gas range and oven, refrigerator, full-size stacked washer and gas dryer, fiber-optic high-speed internet, private yards and two assigned parking stalls. Rare buildable lot on Front Street in Lahaina, close to Mala Wharf, Safeway and Longs, Baby Beach, and Jodo Mission, across from the new Kahoma Village subdivision. This is CPR’d lot, part of a small four-unit subdivision. Build a home, and own a place to store a boat!